Just last week, someone asked me for a list of my favorite iPhone apps. I get this question a lot, so I thought I’d talk about about a few of my favorite apps. No Angry Birds here. I will restrict myself to apps that have some application in the practice of law. That does not mean they are all apps specifically targeted to lawyers. But I hope that they are all apps you will find useful. In fact, you may already have many of them yourself. I use all of these apps on an iPhone, but most are also available for Android and BlackBerry. I’ve designated that using “A” for Android and “BB” for BlackBerry. Fastcase. 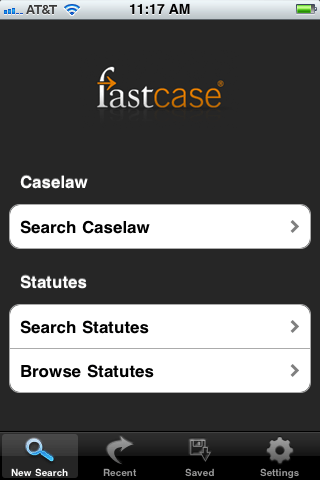 I continue to marvel at this app, which lets you research cases and statutes on your iPhone, entirely for free. Search a full library of federal and state cases and statutes. Use natural language or Boolean queries. Search across jurisdictions and dates or narrow your search. Select how many results to show and how to display the results – by relevance, date or name. This could be a case-saver in the courtroom. Genius Scan. This free app lets you use your phone as a pocket scanner. Open the app, point your camera at the document, take the picture, and the app optimizes the image and saves it as a JPG or PDF file. From there, you can save it to your phone, share it with your computer over WiFi, email it, or tweet it. With the paid version ($2.99), you can easily export your scans to Dropbox, Evernote and Google Docs. Perfect for receipts. I could go on for pages about other apps I use. Unfortunately, I have work to do. Thus, begrudgingly, I will have to stop here.